Don’t throw those holiday candy wrappers away! Repurpose them into a Sweet Valentine for someone you love. To get you started, we’ll paint a watercolor background on a 4 inch x 6 inch card of mixed media paper. 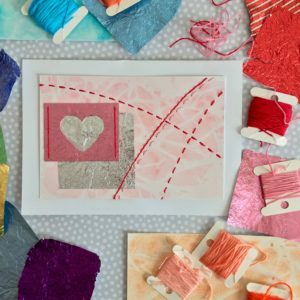 Then embellish the paper with stitches of embroidery thread and add various sizes of cut out heart shapes wrapped with foil wrappers. Use traditional pinks and reds or go bold and try something a little different – orange & turquoise, green & purple? The finished paper will then be glued to a 5 inch x 7 inch card. Each participant will have materials to complete 2 cards, envelopes included. No experience necessary. All materials will be provided but feel free to bring your own the foil candy wrappers to use. Teaching artist Kathy Johnson loves all things paper and works in the mediums of collage, mixed media and eco printing. She likes to find and repurpose natural materials and papers in her art, using everything from tea bags and junk mail to leaf skeletons and candy wrappers.